When I was growing up one of the highlights of the school year was the report card time. I was a good student so I looked forward to the time when my teacher “told” my parents that through the grades and comments on the report card. At work, the closest thing to a report card for an employee is the usually the annual review. If you live in a corporate environment, you know the drill. You show up for the meeting, the manager tells you the bottom (financial) line and then proceeds to list what you have done well or poorly. This process may or may not be an effective one. The review checklist is often the standard one created by the HR department. Sometimes managers complete the review simply to check it off the list of their duties. At other times, an employee may invest very little into the process and miss the chance to get meaningful feedback. The whole process can be perceived as an optional, perfunctory exercise with little benefit. There are times when a report card (and all that it implies) is not optional. So how do you get a report card from senior management? It is probably too much to expect most senior managers to spend time creating a formal report card for you. If you are regularly communicating with them, you will get many signals that express their satisfaction (or lack thereof) with what you doing. A report card is simply one way to stimulate this conversation. And it’s up to you (not them) to get this process started. You have to create a report card for them to use. This works well because senior managers are used to evaluating people and their performance according to set guidelines. 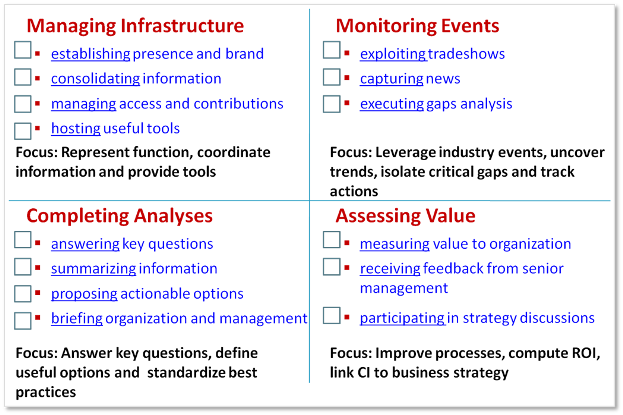 Since there probably isn’t a competitive intelligence specific set of guidelines you will have to create a template to use. Keep it simple and focus on value. The template should be one page or less. It should cover multiple categories. It should be understandable but not too restrictive. Finally, it should be used to highlight exceptional (good and bad) so that meaningful conversations can then happen about those areas. Here is an example. Note that the box to the left of each bullet is the place for a “grade” given by the senior manager. Use the report card for long term planning and education. A virtue of a getting a mark is that you can measure your progress over time. I have used “low” marks to help me define my plans for the future. For instance, I initiated regular CI reviews when I received feedback that the organizational communication about CI topics was too infrequent. Another less obvious use of the report card is that it gives you a vehicle to expand a manager’s perception of CI. Perhaps they never considered that tradeshow intelligence was important. When they see it on your report card they might question what you mean and how it might help them. This is a great time to talk about how CI can be more valuable to them. The grades that you receive don’t matter. Well, actually they do. You won’t long survive if you consistently receive poor grades or if you receive good grades only for the less important (as defined by senior management) categories. However, if the discussion about grades is regular, if your relationship with senior management is deepened and if “low” marks are used for improvement, you will win in the end. Report cards will become your friend and senior management will thank you. And, by the way, that annual review cycle will also likely be a rewarding time for you as well.